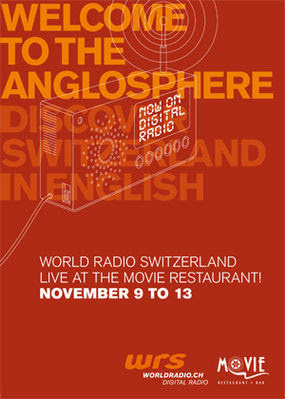 To celebrate their two-year anniversary, World Radio Switzerland (WRS) is hosting live broadcasts of their drive-time show, The Wrap, all next week at the Movie Bar in Zurich from 4:30 p.m.- 7 p.m. I'll be discussing expat life on Tuesday's broadcast, and I'd love to see you there. It's my Swiss radio debut as myself (whew, do I know who that is? ), as I've previously written and recorded stories for WRS under the illustrious persona of Laid-off Liz. I'm trying not to make a fool of myself, so I'm looking for suggestions for the expat discussion. If anyone has a topic about expat life they'd like to hear about, please leave a comment here and I'll do my best to present it if the opportunity arises. Otherwise, I'll just have to rely on everything crazy that has happened to me in this wonderful country we all call home. And if you can't make it, be sure to tune in from home on Tuesday from 5 p.m. - 5.30 p.m. to hear me pretending to actually know stuff when in fact I usually walk around Switzerland clueless. You can listen live online. Chantal, you've published so many great essays and blog posts. You will be awesome on the radio. The topic on my mind these days is how to meet Swiss people. I'm starting to feel like I'll be leaving here in a couple of years and the only Swiss I will have met will be my language teachers. Hi Kathy, thanks, I'm flattered. I can only hope to live up to your expectations at least half-way! 0821jejeSur le drawback, l'Optimus air jordan homme personnalisé peut être un petit peu encombrant en mesure et ne se sent pas vraiment aussi stable que beaucoup d'autres sur asics chaussures de running gel noosa tri 10 ce disque, perdre le cutter guillotine peut aussi être une difficulté qui compromet la sensation et l'apparence, air jordan 29 pas cher attention pour garder ce briquet en un seul morceau. Absolument tout le monde chaussure nike pour homme voulait être comme Mike, donc tous les gens ont couru acheter les baskets qu'il portait quand asics chaussures bleu il menait les Bulls à la victoire. Bien que la fleur soit pantropique, les Philippines asics cumulus femme soldes continuent à considérer la fleur comme leur personne, leurs quelques bouquets indigènes, ainsi que tous les bouquets d'ylang-ylang et asics gel kinsei 5 Chaussures de waling-waling.